"Each performance is really a seated dance"
Like many people, Yina Jin at first had no idea that the sound of a carillon was produced by a real person sitting at an actual instrument high up in a tower. Once she realized that, she began playing a carillon as an undergraduate, and continued to do so after coming to the University of Rochester as a PhD student in Computer Science. “Even now I’m still constantly amazed by the scale of the carillon – how it translates from a keyboard roughly the same size of a piano to a series of bells that can weigh several tons,” says Jin, who is one of the student carillonneurs who study under Doris Aman, an adjunct instructor in the Music Department and the coordinator of the University’s Carillon Society. During the six years Aman has been on campus, several Hajim School engineering students have been drawn to the 50-bell Hopeman Memorial Carillon. “For those students with an engineering bent and keyboard background, the carillon offers a treasure trove of possibilities for both technical and musical expression,” Aman says. For example, Edwin Tan (MS ’02 PhD ’10), an electrical and computer engineering student, not only performed on the carillon, but recorded the bells and designed a way to display and analyze their overtones with Matlab. “The carillon offers opportunities to address the practical realities of architecture, weight support, measuring sound, recording and broadcasting sound/video, analyzing the relationship of sound overtones, bell design, and bell casting,” Aman noted. And it offers a unique stage for musical performance. “Students coordinate and interact with the mechanics of a custom built machine delivering touch sensitive connection to 50 bell clappers of varying weight, while making public music for the campus on a world culture instrument,” Aman said. 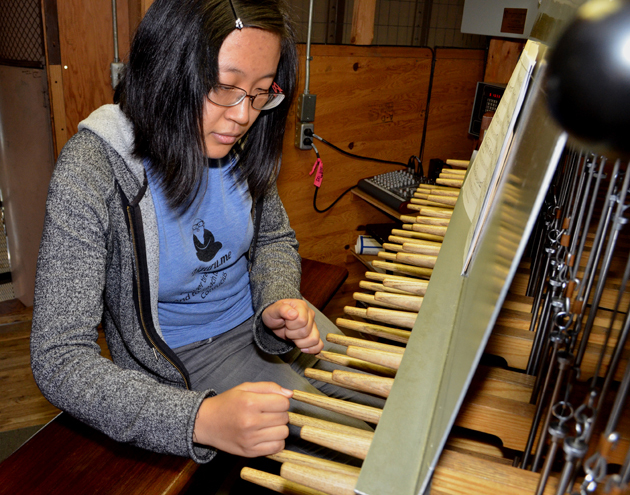 “In carillon duets, engineering students learn to sensitize and sync themselves to others' tempo of movement, breathing cues, and to enhance their own motor coordination. To learn more, contact Aman. To read more about the Hopeman Memorial Carillon, visit the website and take a look at this feature article in Rochester Review.